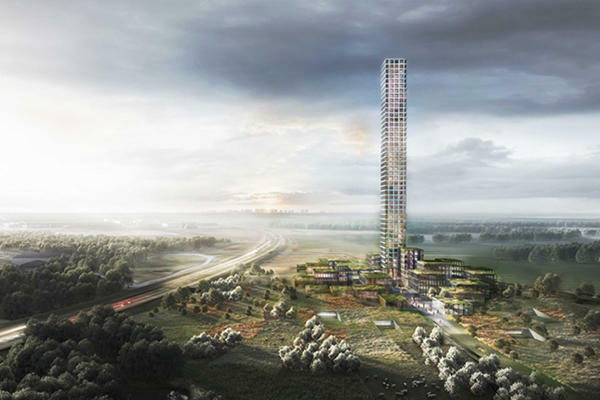 The tallest building in Western Europe may rise in a location few would have guessed: a rural village in Denmark. The 1,050-foot-tall building would be visible for up to 37 miles in every direction from Brande, Denmark, population 7,000. However, Brande has a significant footprint in the fashion world despite its petite size. The town is the headquarters of Bestseller, a company that produces low-price apparel, and it’s also the home of Bestseller’s founder Anders Holch Povlsen, the wealthiest man in Denmark. The planned skyscraper has been dubbed Bestseller Tower and will house office space for the fashion company, plus a hotel and conference facilities. The development will also include ground-floor retail space where Bestseller is expected to display its apparel brands. Danish architecture firm Dorte Mandrup designed the tower with a grid-style façade which bears a resemblance to Manhattan’s infamous 432 Park Avenue.